Saying she tried to forge a compromise, Maine's Republican senator expresses concerns about the potential harm that the change in Senate rules could cause. In a statement issued Thursday after she and her Republican colleagues in the Senate voted to invoke the so-called “nuclear option,” Collins lamented the loss of an ethos she said was built upon trust, compromise and restraint. Sen. Collins: "There is so little trust between the two parties." 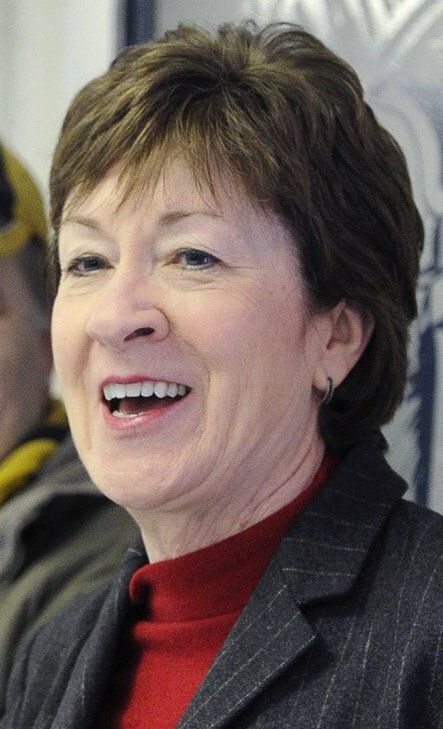 Collins said she had been involved in efforts with members of both parties over the past two weeks to broker an agreement that could have averted the nuclear option scenario and allowed for an up-or-down vote on Gorsuch’s nomination. She urged her Senate colleagues to reflect upon the decisions the Senate makes that are increasingly being influenced by partisan politics and how that climate can be improved. Members of both parties expressed concerns Thursday over the controversial change to Senate rules, saying it could potentially lead to even more partisan animosity in the future. The change, which passed 52-48 along party lines, allows filibusters of Supreme Court picks to be broken with only 51 votes rather than 60 votes. Sen. Angus King of Maine, an independent, joined Democrats in their judicial filibuster Thursday morning, which blocked Gorsuch’s nomination under the previous 60-vote threshold. Four Democrats crossed party lines to side with the Republicans during the vote. “While I still believe we need to reform the way the Senate works so that we can break the logjam in Washington and do our jobs on behalf of the American people, it seems to me that, for major policy decisions like a lifetime appointment, it is not unreasonable to require 60 votes in order to garner broader, more sustainable bipartisan support, which I think is in the best interest of the nation,” King said. Maine’s Republican Party criticized King for supporting the filibuster, accusing him of not living up to his role as an independent. “By siding with liberal Democrats, Sen. King has placed himself far to the left of moderate Democrats in the U.S. Senate supporting Judge Gorsuch,” said Jason Savage, executive director of the Maine Republican Party. Gov. Paul LePage, who has said he might run against King in 2018, also chimed in. “With this vote, Angus King has proven he sides with the extreme liberals in the Democratic Party and against common sense governing,” LePage wrote on his Facebook page. Collins regretted the failure of the effort to forge a compromise on the Gorsuch vote. “Unfortunately, there is so little trust between the two parties that it was impossible to reach an agreement,” she said. “… The majority of my Democratic counterparts simply disagree with the notion that the filibuster should only be used in the nomination process under extraordinary circumstances.